The National Trust is releasing enough land for up to 1,000 allotments, on some of the most famous country estates in Britain. The land will be available for individuals or community groups in England, Wales and Northern Ireland. The release will be organised through the Landshare website, which matches growers with available land. The Trust says there are now 100,000 people on waiting lists for allotments around the country. BBC environment correspondent Sarah Mukherjee said it was not long ago that allotment gardening was a deeply unfashionable pursuit, with many plots abandoned, and few people willing to take them on. However, increasing consumer interest in where food comes from, combined with concerns about food miles and sustainability, has led to an allotment renaissance, our correspondent added. The Landshare website was set up by television chef Hugh Fearnley-Whittingstall to "match-make" would-be growers and those with land available. 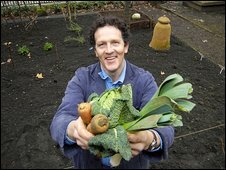 The 1,000 growing spaces will be created by 2012 and the scheme is being backed by celebrity gardener Monty Don. He said: "I'm so passionate about the importance of this, it's what we have to do. "Allotments connect ordinary people to the beauty and richness of growing things. In an age of deceit and spin and collapse there is absolute integrity about growing food. "All politicians should have an allotment, and if they don't keep it up properly they should lose their jobs and I promise you the country would be better run." The Trust's plots will be available at around 40 different locations, varying in size from smaller areas for new growers, to larger plots suited to community growing schemes. Many Trust properties also have experienced gardening volunteers who are ready to give advice. It has been estimated these new growing spaces could produce around 50,000 sacks of potatoes a year - or mixed produce worth £1.5m. The Trust's director general Fiona Reynolds said the scheme tapped into the current mood of the public. She said: "There's something in the air. More and more people want to grow their own fruit and vegetables. "This isn't just just about saving money - it's really satisfying to sow seeds and harvest the fruit and veg of your labour."